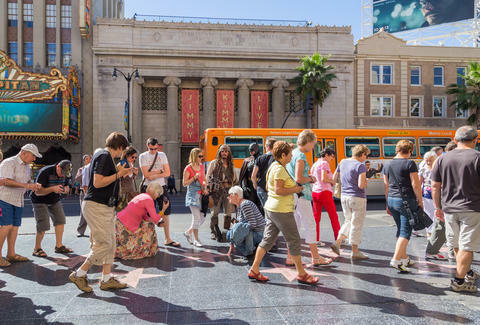 Everyone knows Hollywood's the entertainment capital of the world, and as a result, it's easy to fall victim to tourist traps like Starline Tours, Universal CityWalk, or the Walk of Fame. Of course, there are plenty of things to do in Hollywood that don't have the word "walk" in them, and we've gathered the best of the best together into one checklist. Whether it's watching live music in an iconic venue, solving an interactive escape room, or visiting a straight-up death museum, these are the things you should be doing in Hollywood instead of hopping on a bus to see Kathy Griffin's house. Escape Hotel is one of the best-rated live escape rooms in the city, with varying difficulty levels and riveting themes. There’s nothing like teamwork under pressure to get you focused and thinking on your feet while having braintastic fun. See if you and your group can work together to solve the series of puzzles within the hour -- or meet your untimely (rhetorical) death. While cemeteries are probably the last place you’d consider an attraction, the historic Hollywood Forever Cemetery has plenty of reasons to visit throughout the year. During the warmer months, movies are screened on the vast lawn, where you can picnic with loved ones while enjoying a classic. Concerts and other cultural events like plays and book readings are scheduled throughout the year, whether on the outside stage or in the cozy Masonic Lodge, so be sure to check the schedule for the movie or show of your choice. 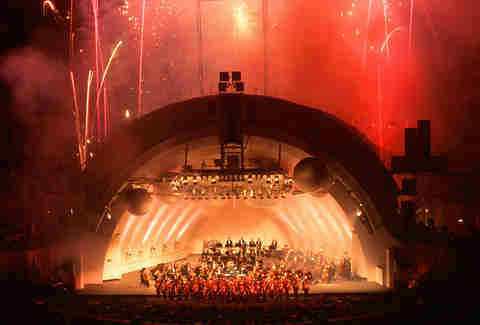 The Hollywood Bowl was first built in 1922, opening with a concert by the Los Angeles Philharmonic. Since then, it’s undergone massive architectural and acoustic improvements and seen performers as lauded and wide ranging as The Beatles to Itzhak Perlman. Catching a concert here is one of the most essential and accessible Hollywood acts thanks to its wide-ranging programming and affordable price points on tickets. Inside the historic, haunted Roosevelt Hotel is a low lit, vintage gaming space complete with delicious craft cocktails. Book one or both bowling lanes for your group, and maybe even a punch bowl or two to imbibe on during your game. They’ve also got vintage board games such as Connect Four, Monopoly, chess, dominoes, backgammon, and checkers for all kinds of entertainment. Be sure to check the schedule for curated cocktail nights and special events. Lovers of kitsch and the morbid-minded will enjoy a self-guided, hour-long tour through Hollywood’s Museum of Death. See artwork by Gacy and Manson, recount historical famous deaths, watch cult recruiting videos, learn about the Black Dahlia as well as past and current execution methods -- y'know, lots of family-friendly stuff. Sitting atop Olive Hill, Frank Lloyd Wright's Hollyhock house is the centerpiece of Barnsdall Art Park in East Hollywood. Built between 1919 and 1921, the house was his first Los Angeles project and second work in California. This one-time residence of Aline Barnsdall (an oil heiress) incorporated her favorite flower into its name and design, and is now a designated National Historic Landmark. Tours are available for $7 for adults and $3 for children and seniors, and are held Thursday through Sunday, 11 am - 4 pm. 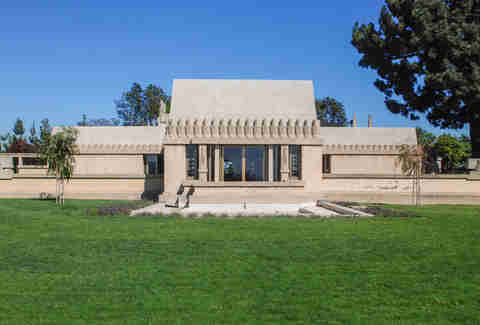 Nearby the Hollyhock House at Barnsdall Art Park is the Los Angeles Municipal Gallery, which opened in its current gallery space in 1970 and is the flagship exhibition space for the City of Los Angeles Department of Cultural Affairs. The gallery features emerging art by Los Angeles artists as well as retrospectives on those LA artists who have made a major impact on the art scene. Free group tours for adults are offered Thursday through Sunday, 12pm - 5pm. Now with two spaces in Hollywood, Upright Citizens Brigade has plenty of opportunity to make you laugh your socks off. This training ground for current and future comics holds a range of shows to keep you entertained, including improv, stand-up, sketch, talk, and variety. Check the schedules at both locations (Franklin and Sunset) to see which show fits your schedule and fancy, with prepaid and cash-only reserved seating. Built in only 16 weeks and opened in 1963, the Cinerama Dome is a first-run theater that also happens to be a Los Angeles Historic Cultural Monument, and is now a part of Arclight Cinemas. It seats over 800 guests, has a top-notch sound system with three restored Cinerama projectors, and since beer, wine and very recently, top-notch cocktails created by the Death & Co. people, are all available as concessions at Arclight Cinemas, you can enjoy the latest blockbuster over a glass. While most of us enjoy streaming music services these days, there’s just something about actually browsing a brick-and-mortar location to buy a physical copy of the latest album of your favorite band of the moment, or a limited edition vinyl of an old classic. 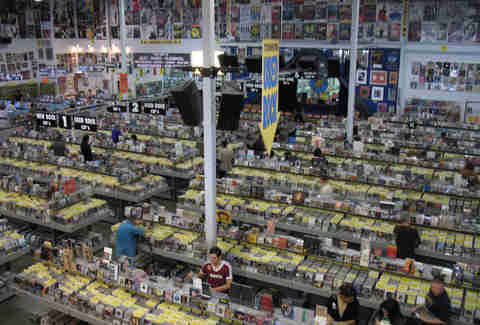 No matter what you're after, you can probably find it at Amoeba Music's Hollywood location, which is the largest independent record store in the world -- there are also free live shows on-stage inside the store, often followed with signings by the artists. In lieu of the chintzy tourist shopping that tends to occur in Hollywood, you’ll want to take a spin through this mixed-use concept store. Sure, there are burgers, clothes, and skateboards to shop for here, but make sure to check the event calendar for the stuff that really keeps this space popping, like outdoor yoga classes, record fairs, wine tastings, book signings, and live music performances. 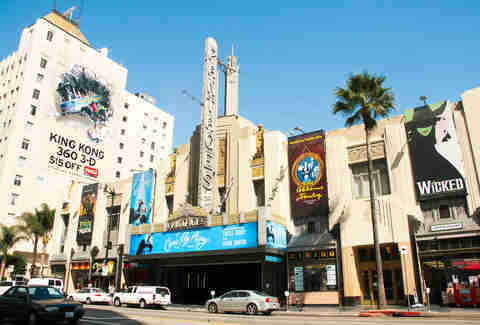 When popular musicals, plays, and concerts come through Los Angeles, they always play at The Pantages Theatre, a historic Art Deco venue dating back to 1930. Book tickets to whatever show catches your eye, but make sure arrive early to gaze up at the ornately decorated ceiling. You might also want to grab a pre-show drink at the adjacent Frolic Room, a dive bar with an excellent jukebox that hosts a mix of locals and tourists. Hollywood and Vine may be the most famous intersection in the city, but you’d be remiss to overlook this fantastic cocktail bar. There’s a little corner full of books, party favors, articles of clothing, and other knick-knacks ("one man’s trash," etc.) that patrons can browse -- if you take something, make sure you leave something else behind for the next person! Of course, that’s after you sip through one (or a few) Vermont Shandys at one of the tables in the dimly lit lounge area. Hollywood & Highland is a behemoth of a shopping destination -- all inspired by the set of the D.W. Griffith film, Intolerance -- but there’s still good reason to venture inside the mall during the summer. Every Tuesday from 7-9pm, jazz concerts are held in the courtyard in partnership with local station KJAZZ-FM. Ten dollars will get you two glasses of wine and an appetizer, with proceeds benefitting Project Angel Food. Studios come and go in Hollywood, but Paramount Pictures remains one of the most storied lots in the city. There are three tour varieties available, each running anywhere from two to four hours, with over a century of feature and TV history to explore. Whether you want the basics (the Studio Tour), the upgrade complete with gourmet lunch and hors d'oeuvres (the VIP Tour), or the nighttime treatment with secret passageways (the After Dark Tour), Paramount’s the place to get your Silver Screen history fix. Esther Tseng is a freelance writer who used to live in Hollywood but now lives in East Hollywood while intermittently lying about living in a certain adjacent, overblown neighborhood without the word "Hollywood" in it. Follow her trappings: @estarLA.